One day about 18 months ago a flat pack parcel arrived for me at home in Adelaide. I noticed it was from the US. I often send art to shows in the States and if it doesn’t sell, it gets sent back to me. However at this time I wasn’t expecting any returns. I noticed it was from my friend Diana Lee. Maybe she’d sent me a magazine? Excited, I ripped the parcel open to be faced – literally – with myself. Diana had colluded with my lovely but sneaky wife Gaynor and the result was a fabulous portrait of me. Totally unexpected and the best surprise one could get. To put things in context, Diana Lee could be described as one of the finest artists in the world without a shadow of doubt. 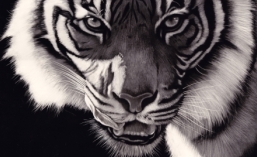 She is a pioneer of scratchboard art and has inspired many many artists to get involved with this fine art medium. She was with me when we created the International Society of Scratchboard Artists with five other artists. Due in no small part to her, this society has now gone global and as a result, Diana has ended up touching even more lives. She certainly touched mine and my family’s. We all loved her and I’m devastated by her passing to an aggressive form of cancer. This is the portrait she did of me and underneath that a selection of her art which will show you why I consider her so highly. However, no matter how good her art was, it didn’t match up to how good she was as a human being and I will sorely miss her. What an amazing legacy she leaves behind. Taken too soon. Patrick what a terrific gift you received from Diana Lee…. wow her work is amazing!For sure she is watching from above and so happy to have enjoyed time with you. SuchA beautiful tribute with your words. I am sorry for your loss but happy for the treasuredMemories you have of Diana. With kindest regardsBonnie LucasOttawa, Ont. Can. Thank you for sharing her awe-inspiring masterpieces. What a remarkable artist. She will be dearly missed.